Khalifa Haftar’s order to the self-styled Libyan National Army (LNA) came as UN Secretary General Antonio Guterres was visiting Tripoli. Mr Guterres spoke of his concern and urged an end to the escalation. 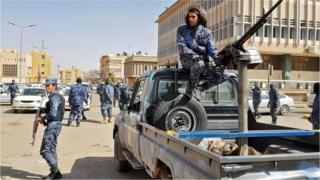 Libya has been riven by violence and deep divisions since its long-time ruler Muammar Gaddafi was deposed and killed seven years ago. The LNA says it has secured Gharyan and moved on. The internationally recognised and UN-backed government in Tripoli said it had put its forces on high alert.